Food is an integral part of India's culture, with cuisines differing according to community, region, and state. Indian cuisine is characterized by a great variety of foods, spices, and cooking techniques. Furthermore, each religion, region, and caste has left its own influence on Indian food. Many recipes first emerged when India was predominantly inhabited by Vedic Hindus. Later, Christians, British, Buddhists, Portuguese, most importantly Muslims from Turkish, Arabs, Mughals, and Persians settlers and others had their influence. Vegetarianism came to prominence during the rule of Ashoka, one of the greatest of Indian rulers who was a promoter of Buddhism. In India, food, culture, religion, and regional festivals are all closely related. Indian meat and fish cuisine is mostly influenced by the Muslim population. On our recent trip to India, we picked up a number of recipe books. We had a lovely summer evening and decided that it was time to fire up the grill and try out a new kabab recipe. This week we tried the "Nawabi Kalmi Kabab". 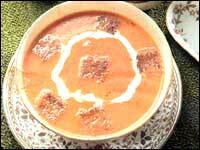 Kalmi Kababs are very popular in India and you will find them on most North Indian restaurant menus. Kalmi kababs are typically made with chicken drumsticks, but this recipe recommended chicken thighs. Maybe the nawabs did not like drumsticks. We prepared the recipe using the ingredients mentioned and followed the 2 step marination process, but we grilled it on a regular gas grill. The kababs turned out really great. The kababs were very soft and succulent, probably due to the heavy use of cream and cheese. They were also spicy and tangy but not very hot. You can increase the heat by adding more chilly powder. We had the kababs with a simple rice pulao. We would recommend that you try the Nawabi Kalmi Kabab. To me, there is probably no better way to start a meal than with a nice bowl of hot soup. A lot of the Indian meals begin with a nice hot bowl of soup that warms both the palate and the rest of the taste buds with the spices. From the Rasams in the South, to the Shorbas of the North, to the British influence Mullinatawny Soup, you can find a good number of soup recipes in our soup recipe section. We hope you enjoy this part of our Recipe collection. Anjum Anand grew up in London but has also lived and studied in Geneva, Paris, and Madrid. She speaks French and Spanish, holds a degree in European business administration, and for a period ran a business importing flat-pack furniture from eastern Europe. She has worked in the kitchens of hotel restaurants including at Cafe Spice in New York, as a waitress in Park Royal Hotel in New Delhi, and for Tommy Tang at Mondrian Hotel in Los Angeles. Her perspective on adapting healthy meals from a traditionally rich Indian diet came from personal experience of weight problems while growing up. Her diet consists of varied traditional dishes, recreated with wholesome ingredients and limited oil. At age 25 her first book Indian Every Day: Light Healthy Indian Food was published. Anand became a regular guest on UKTV Food's Great Food Live from 2004 to 2007, and featured in the BBC Two series Indian Food Made Easy broadcast in 2007. 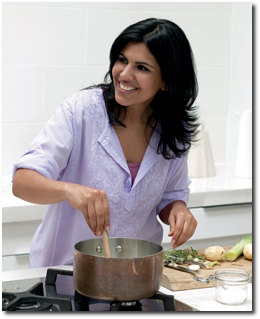 Her accent and flirtatious manner have led to her being dubbed "the Nigella Lawson of Indian cuisine in Britain". Reacting to descriptions of herself as "television's tastiest chef", she finds it "preposterous". You can find a collection of her cooking videos in our recipe section.